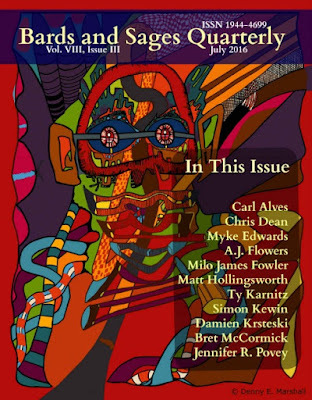 Mercer the Soul Smuggler returns in his last short story, included in this month's issue of Bards and Sages Quarterly. Five years ago, my second Mercer tale appeared in their July issue, so it seems fitting for Mercer's journey to end there -- for now. What's next for Mercer? I have a few ideas I've been kicking around, maybe for a novella or novel. Haven't decided yet. I know I'll be compiling all 9 of the Mercer tales into an updated edition of Soul Smuggler, available later this year in trade paperback and all eBook formats. Hopefully in time for Halloween. I've already got the cover art (finally) the way I like it. Armageddon is coming, and the devil wants his due -- those suicidal souls Mercer has been escorting to the Pearly Gates. It's not enough to have the Terra Sacra pester Mercer; now agents of Lucifer are interfering with his business. And the Soul Smuggler doesn't like that at all.